The momentous Kevin Durant announcement of July 4, 2016, was foreshadowed years earlier, before the Golden State Warriors commanded enough attention for people to notice. "Steph and I played together in 2010 in Turkey, and after practice we would come back to the gym at night when we were overseas and just [get] some shots up. I believe it was Kevin Durant [who] was with us, a lot of the time. So it was us three, maybe one or two other guys, but us three were always together. Kinda got a chance to see him work. Knew how in love he was with the game, so we built a pretty good relationship. We had chapels together before every game so we definitely got to know each other. "Us three were always together." If the 2013 Warriors were at a then-Lakers level of clout, such a statement would have reverberated across the internet, fueling rumors far and wide. But the 2013 Warriors had nowhere near the cachet they enjoy today. They had done well to even get into the room to make a pitch to Dwight Howard that offseason. Wooing Iguodala was quite the coup for an organization fresh off its second playoff run in 19 years. What a difference three years can make. That's how quickly this new, dominant Warriors reality emerged from a long-standing reputation as the ignoble underdog. That's how fast a team goes from being the harmless bastion of comical futility to the league's existential threat. In 2013, neophyte 6-seed Golden State shocked Denver and put a scare into San Antonio in the playoffs. In that offseason, GM Bob Myers pulled off what he called the hardest thing he has ever done professionally when he moved massive amounts of salary to secure Iguodala. A year later, the Warriors lost in Round 1 to the Clippers and controversially fired Mark Jackson. Then came Steve Kerr's hire, Draymond Green's move into the starting lineup, Curry's MVP ascendance, 67 wins and a championship. And all of that was followed by last season's 73 wins, a painful loss in Game 7 of the NBA Finals after holding a 3-1 series lead and, now, the pretext for a team unlike anything the league has seen. This remarkable three-year sprint to fame and possibly infamy was in some ways set up six years ago by the FIBA World Championship in Turkey that Iguodala referenced upon joining the Warriors. That was Durant's tournament (he won MVP), if you recall, a time when he was heralded as a new, wholesome alternative to a LeBron James who'd just left Cleveland on national television. In contrast to LeBron's garish Cleveland exit, Durant garnered praise in the summer of 2010 with a tweet announcing his Oklahoma City Thunder extension. Little did people know that the seeds for Durant's eventual departure were being sown at that moment in basketball history, as he got to know Team USA teammates Iguodala and Curry. Given the state of the 2010 Warriors, none of the actors involved could have known where this was headed. 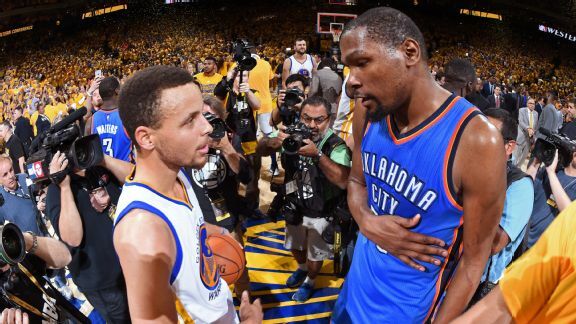 Flash forward to the Warriors' 2016 pitch to Durant. Iguodala reminded KD of those Turkey days and how much fun they all had together. The veteran swingman is sarcastic by nature and extremely cynical. Some posit that his guard remains up because of his Philly experience, where a rabid local media shredded a young, pass-first wing for being something less than Allen Iverson. A sincere, emotional Iguodala brought that up too, conveying how money and status can't compare to his current situation. The 2015 Finals MVP also offered a bit of time travel in his pitch to Durant. He explained how, when your career is finished, you want to reminisce with friends like these. He depicted a future where so much of the present NBA entanglements fade away and a career becomes a memory. When that happens, there's meaning in having great memories. When that happens, there's meaning in being able to revisit those memories with great people. Golden State's pitch had all of these elements, augmented by a Jerry West phone call. It's difficult to determine if any speeches were needed, though. Most of the actors here knew each other. It would be naive to think communication was confined to a room in the Hamptons. This has been a long process, and one the Warriors were confident in for some time. Some within the organization believed Russell Westbrook and Durant had some chemistry issues in Oklahoma City, and in those issues lay an opening. The Warriors could offer glory, brotherhood and an unselfish playing style, not to mention Bay Area business opportunities. Still, there were no guarantees and despite whatever assurances were offered, Warriors officials were nervous until the news broke officially. So much planning could have been dashed in a decision Durant made in an instant. It's staggering to consider all that had to go right. The Warriors were helped by Curry's ankle blessing them with the best contract in sports. They were helped by Thompson agreeing to a max-ish contract that wasn't pegged to the rising salary cap. They were helped by Green accepting a below-market deal. They were helped by the players' union rejecting cap smoothing, which opened up the space needed to get Durant in 2016. Myers needed to be better than great and just as fortunate. When asked how long planning for Durant took, a Warriors official quipped, "About three light-years." Then, a correction: "Actually, light-years is a measure of distance, not time." In a short period of time, Golden State leaped forward a great distance, far beyond any reasonable expectation and possibly beyond anything we've ever seen in the sport. This team looks more complementary than the feared 2010 Miami Heat, especially after the cheap acquisition of center Zaza Pachulia. The best-shooting team ever just added Kevin Durant. It's a staggering reality to behold. The power of shared memory just helped launch a basketball team into what feels further than futuristic.